La Societe Im. Ex. Ci. 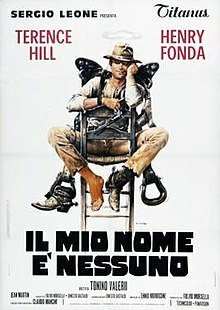 My Name Is Nobody (Italian: Il mio nome è Nessuno) is a 1973 western comedy film starring Terence Hill and Henry Fonda. The film was directed by Tonino Valerii. Jack Beauregard (Henry Fonda) is an aging gunslinger who wants to retire peacefully to Europe. Three gunmen attempt to ambush him in a barbershop. After he has dispatched them, the barber's son asks his father if there is anyone in the world faster than Beauregard, to which the barber replies, "Faster than him? Nobody!" Beauregard pauses on his way to watch a bum (Terence Hill) catching fish. He then rides to an old goldmine, only to find his friend Red has just been shot by a gang. Beauregard asks about the whereabouts of a certain Nevada, but Red only manages to disclose Nevada's village before dying. At a horse relay station, the bum is asked by three men to deliver a basket to someone inside who turns out to be Beauregard. The bum talks to Beauregard, revealing his detailed knowledge of Beauregard's feats, then throws the basket outside. The bomb hidden inside explodes. The bum identifies himself as "Nobody". He idolizes Beauregard and wants him to end his career in style by taking on all 150 of the Wild Bunch single-handed. The bandits are using a worthless goldmine to launder their stolen gold. Sullivan, the mine owner fronting for them, thinks Beauregard is out to kill him, and is trying to get him first. The leader of the Wild Bunch tells Sullivan not to give away their operation. At Nevada's village, Beauregard finds Nobody already there. He reveals that the Nevada Kid, Beauregard's brother, is dead. Again Nobody challenges him to face the Wild Bunch. Again Beauregard declines. Nobody arrives at a town. After showing his skill with a gun, he is hired by Sullivan to kill Beauregard. Instead, he helps Beauregard to do away with Sullivan's men. Then the Wild Bunch ride into town to collect sticks of dynamite, stashing them in their saddlebags. Later, an old man tells Beauregard that he was bought out of a worthless gold mine by his partners Nevada and Red, only to have the mine produce lots of gold afterwards. Beauregard hurries off to the mine and catches Sullivan loading sacks of gold powder. Sullivan offers Beauregard Nevada's share, but Beauregard tells him he could not care less about his brother, and just takes two sacks, as well as $500 to pay for his passage to Europe. He then leaves to catch a train to New Orleans. A train is being loaded at a station with bars of gold, guarded by soldiers, when Nobody steals the train. Beauregard is waiting down the line when the Wild Bunch charge towards him across a featureless plain. Nobody arrives with the train, but refuses to rescue Beauregard until he "makes his name in the history books". Remembering the mirrored conchas on the gang’s dynamite-filled saddlebags, Beauregard aims at them. One by one, they explode, blowing up most of the charging gang until Nobody lets him board the train. In New Orleans, Beauregard and Nobody finally face off in the street, with a photographer on hand and lots of spectators. Nobody is the faster, and Beauregard falls to the ground. A sign is put up reading "Jack Beauregard 1848–1899 Nobody was faster on the draw”. What's left of the Wild Bunch see it and switch their search to the anonymous Nobody. Later, Nobody walks by the ship (named Sundowner) that was to take Beauregard to Europe. However, it is revealed that Beauregard is in his cabin aboard, writing Nobody an affectionate farewell and leaving him to survive in his own playful and unheroic way. Shooting for My Name is Nobody started on April 30, 1973. It was one of the few films related to Sergio Leone where 80% of the outdoor scenes were actually shot in the United States. The film was shot in nine weeks. Filming took place at Acoma Pueblo, at the mission of San Esteban Del Rey in New Mexico and in the chalk dunes at White Sands. Leone predominantly stayed at home for the shoot and went to join the crew for five days in New Orleans. Leone replaced director Tonino Valerii, who was suffering from an ear infection, for one day on the set. Tensions rose on set between cinematographer Armando Nannuzzi and Valerii. Fonda was being told how to pick up money off the ground and was told two different ways to pick up between Valerii and Nannuzzi. Their relationship became more intense, with Nannuzzi eventually leaving the film. When the film began shooting in Spain in Almeria and Guadix, Valerii had a new cinematographer Giuseppe Ruzzolini and Sergio Salvati. Salvati worked as a cameraman uncredited for the sequences of the duel among mirrors and Nobody's meeting with Sullivan in the gambling room. A new problem arose on set when costumes for Henry Fonda vanished, leading to production stopping for nine days. This led to paying a high penalty to keep Fonda for a few days or postpone shooting until he was free again. Leone proposed to Valerii that they either cut 30 or 40 pages from the script or create a second unit to finish the film. Leone offered to take the second unit shots, which Valerii accepted. Claudio Mancini warned Valerii, stating that Leone would take credit for the film when they go back to Rome if he let him shoot anything. Valerii took over scenes involving Henry Fonda and the action sequences in the desert, while Leone directed the saloon scene with Terence Hill showing his gunslinger skills and parts of the sequences in the village festival, and the public urinal scene which was not in the original script. Assumptions range between how much Leone contributed to the film. Christopher Frayling noted that "the most likely scenario is that Leone helped out on a duel, then took over second-unit work on 'the battle', and then directed the opening scenes and the carnival section of the film." John Landis, who was claimed to be an extra in the film, said that "We shot for a couple of weeks, among hundreds of extras on horseback, attacking and firing wildly. Fonda and Hill kept us all at bay. [...] Leone directed that battle on horseback." Neil Summers who played Squirrel stated that Leone "directed most of the scenes I was in [...] [Leone] worked slowly and was constantly trying new angles with his camera and new innovative shots with his actors." Valerii himself stated that "scenes filmed by Leone are: Terence Hill getting drunk in the saloon (but not the close-ups of that shattering glasses, I shot those myself; and also the footage of the betting, with Piero Lulli taking the money, is mine); the part of the sequence at the fair which starts from the moment where Nobody steals the apple from the boy, to the episode of the pies thrown at the negroes' faces; the digression in the public urinal, [...] and several close-ups of Nobody who, while Beauregard fights the Wild Bunch, takes note of the body count as if they were points at a game, another addition on the part of Leone, who thought it was a funny idea." Screenwriter Ernesto Gastaldi confirmed Valerii's comments stating that "Tonino shot the whole film, absolutely ON HIS OWN" and that Leone "organized a second unit crew and shot a couple of sequences, which in my opinion are the weakest in the film: the urinal, stretched in an abnormal way, and the glass contest in the saloon. Nothing else." Sergio Donati expanded on this, stating that some photographers were sent over by the press office, and asked Leone, who was on set for a single day, to sit behind camera in a director's pose with Valerii's permission. Donati stated that "inevitably, from that moment on, everyone, in and outside the movie business started saying "Yeah, actually the real director of the film was Leone, who saved it from the disaster of an incapable director". Leone's own discussion following the film's release often contradicted itself. Prior to its release in Italy, My Name is Nobody was released in West Germany and France on December 13 and 14 respectively. My Name is Nobody was released on 21 December 1973 in Italy where it was distributed by Titanus. The film grossed over 3.6 billion lire and was the third highest-grossing film in Italy of the year, behind Salvatore Samperi's Malicious (5.5 billion lire) and Dino Risi's Sessomatto. In the United States, it was cut to 111 minutes where it "nearly flopped" according to Italian film historian Roberto Curti. ^ Marchese Ragona, Fabio (2015). "Storie di locandine - Il mio nome è Nessuno". CIAK Magazine (in Italian). Vol. 10. p. 27. ^ a b c d e f g h Curti 2016, p. 197. ^ a b c Curti 2016, p. 198. ^ a b c d e f g h i Curti 2016, p. 82. ^ a b Curti 2016, p. 84. ^ a b c d e f g Curti 2016, p. 85. ^ a b c d e f g h i j k l m Curti 2016, p. 86. ^ a b Curti 2016, p. 87. This page was last edited on 31 March 2019, at 19:21 (UTC).